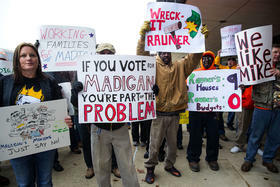 People against the re-election of Ilinois House Speaker Michael Madigan rally on inauguration day for representatives. 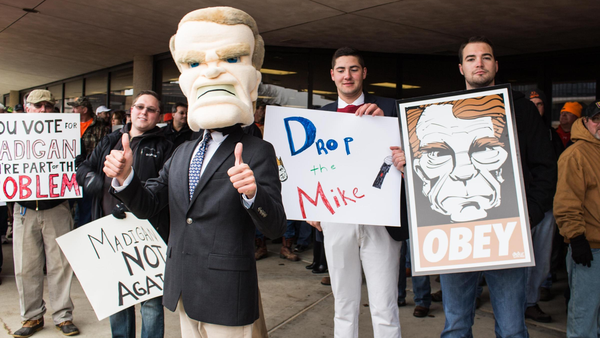 Supporters of Madigan rallied as well. 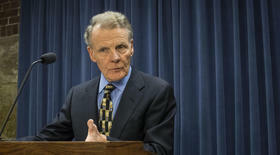 Anti-Madigan effort fails to sway House members in speaker election. NPR Illinois' Brian Mackey interviews columnist Charles N. Wheeler III. Commentary - Well! That was quite the anti-climax. After millions of Gov. Bruce Rauner’s dollars and months of Republican vituperation spent demonizing Michael Madigan, the Illinois House voted 66 to 51 last week to make the veteran lawmaker from Chicago’s southwest side speaker of the House for a 17th time. About all the anti-Madigan forces had to show for their week-long “countdown” to inauguration day was a “present” vote by Democratic Rep. Scott Drury of Highwood, who said later he was “confident that my vote represents the view of the vast majority of my constituents.” Be that as it may. As the historic 100th General Assembly got under way, though, both Madigan — who chairs the Illinois Democratic Party — and re-elected House Republican Leader Jim Durkin of Western Springs urged bipartisan cooperation. Similar sentiments were voiced by the newly elected, returning Senate leaders, President John Cullerton of Chicago and Minority Leader Christine Radogno of Lemont. Two days earlier, the pair unveiled the framework of a “grand bargain” that they negotiated over the holidays to break the state’s budget impasse. The package includes higher income tax rates, a new tax on sugared drinks, other revenue measures, new spending for higher education and social services, a minimum wage increase, gaming expansion, pension changes and other provisions, including some from the governor’s wish list. “I think the state has been shaken up enough, and now it’s time to make Illinois great again,” said Cullerton, to applause from both sides of the aisle. Underscoring the cooperative spirit, the first 13 bills introduced in the new Senate embodied the package’s various pieces, with committee hearings scheduled for later this month. The targeted lawmakers “chose to put the political machine ahead of the people ... the only way to get a new speaker ... is by getting rid of legislators” who supported Madigan, claimed the partisan posts. The contrast was clear — while Durkin and Radogno might want to return to the time when campaign tactics took a back seat to governance and civility was the norm, the party’s shock troops weren’t ready to end hostilities. Of course, the governor has professed little interest in what the Republican worker bees are doing with his money; he says he’s too focused on moving the state ahead. His denials bring to mind the famous line from Casablanca, when the corrupt French officer, Capt. Louis Renault, exclaims, “I’m shocked, shocked to find that gambling is going on in here!” as he pockets his winnings in Rick’s Cafe. Perhaps the most dismaying aspect of the unprecedented smear campaign is the fact that any number of newspaper editorial boards have bought into the “Boss Madigan” narrative without questioning the purported facts backing up the arguments made by the governor and his allies. For example, “Governors have come and gone since 1983, when Madigan assumed the speakership. Boss Madigan is the constant here. In effect, Madigan’s district — a few blocks in southwestern Chicago — has run Illinois for 34 years, and run it into the ground,” harrumphed one downstate daily’s editorial page, urging its local lawmaker to vote against Madigan. Now, as a longtime reporter, I’ll admit that I’ve always been skeptical of newspaper editorials but figured the folks owning the paper can say whatever they want, as long as the opinion is based on fact. However, even a rudimentary understanding of state government and a cursory online search of past Illinois leaders would disclose how Madigan’s supposed “running” of the state for 34 years — his “kingship” — is nonsense. For starters, while speaker is undeniably a powerful position in the House, the post has little to no sway in the other legislative chamber, the Senate. And, of course, whatever legislators decide to do, the governor has almost the final say with a range of veto powers. But wait, can’t the legislature override vetoes? Sure, but despite their veto-proof majorities on paper, Democrats overrode only two of more than 100 vetoes in Rauner’s first two years, one of them with his blessing. Such fundamentals aside, consider the other key players over the past 34 years, since Madigan first was elected speaker, in January of 1983. Just a couple of days earlier, Republican Gov. Jim Thompson was sworn in for the third of his four terms, to be followed by eight years of Republican Jim Edgar and four years of Republican George Ryan in the governor’s mansion. So for the first 20 of those years, Madigan’s supposed one-man rule had to deal with GOP governors. Moreover, Republicans controlled the Senate from 1993 to 2003, and anyone who thinks Senate President James “Pate” Philip was somehow controlled by Madigan is seriously deluded. Were the question posed to Pate, his direct answer likely could not be aired due to FCC regulations, but the gist would be a firm “no.” Besides, Republicans also controlled the House for two of those years, 1995 to 1997. Even during the 12 years of Democratic governors Rod Blagojevich and Pat Quinn, Madigan hardly had a free hand to do as he wished; in fact, on balance Madigan worked better with GOP chief executives than with either of his party mates. So a more accurate recounting of Madigan’s tenure would note that whatever blame he might bear for Illinois’ fiscal woes — or running the state into the ground, in newsie speak — Republican governors and lawmakers of both parties share in the culpability. Another fact — in all the years of Madigan’s speakership from 1983 until 2015 — actually, since Illinois became a state in 1818 — governors and legislators have managed to craft state budgets, on a biennial basis before the 1970 budget year, and annually since then. Only Rauner has been unable to do so, and the state’s condition has deteriorated markedly under his watch. Boring as the history lesson might be, editorial writers — and reporters, too — owe it to the audiences they serve to get the facts right, rather than parroting political spin from partisan shills. Illinois Issues is in-depth reporting and analysis that takes you beyond the headlies to provide a deeper understanding of our state. Illinois Issues is produced by NPRIllinois in Springfield. Copyright 2017 WUIS-FM. To see more, visit WUIS-FM.